The Bonner Bridge replacement project is an endeavor that has spanned decades. With the current Bonner Bridge passing its 30-year lifespan in 1993, the road to reach a new bridge was crowded with red tape, lawsuits, and unexpected obstacles during the building process – which included runaway barges and an island-wide power outage. 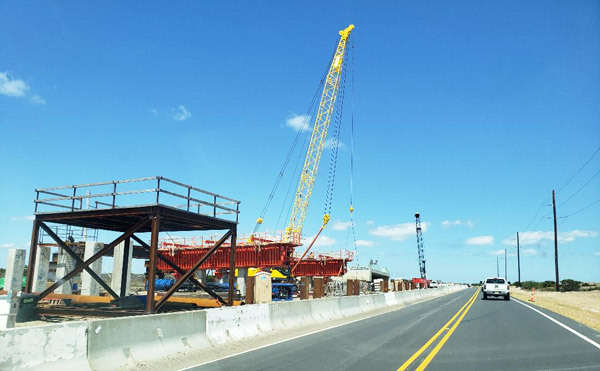 Take a closer look at the timeline for the building process, and the hurdles that were cleared along the way, as the island continually moves closer to an official opening of the new bridge across Oregon Inlet. 1990. State begins feasibility study for replacing the Bonner Bridge. November, 1993. A Draft Environmental Impact Statement on bridge replacement is released for review, which favors a parallel bridge to the existing structure. 1996. A Preliminary Final Environmental Impact Statement is issued, which was never signed because of a lack of consultation with the U.S. Fish and Wildlife Service. 2001. Because it had been more than seven years since the completion of the DEIS, a re-evaluation is conducted to determine if the preliminary FEIS remains a viable alternative. A decision is made to prepare a supplement to the DEIS. 2002. Work begins on the Supplemental Draft Environmental Impact Statement (SDEIS) supplement to the DEIS. June, 2002: A NCDOT Bridge Inspection Report rates the condition of the existing bridge as poor, with a rating of 4 out of 100 points. That rating would later change in 2007 to 2 out of 100 points. September, 2005. The supplemental DEIS is completed and signed. It includes five alternatives, including both short and long bridge options. November, 2005. Public hearings are held on the SDEIS. 2007: The “Replace the Bridge Now,” a grassroots organization advocating for the immediate replacement of the Bonner Bridge, is formed. February, 2007. The supplement to SDEIS is signed. This supplement to the original supplement includes two new parallel bridge options. March, 2007. Two public meeting are held on the supplement to the Supplemental DEIS. September, 2008. The Final Environmental Impact Statement is signed. It favors a Parallel Bridge with a Phased Approach and a Rodanthe Bridge as the preferred alternative, and addresses comments made on the SDEIS and SSDEIS. May, 2009. A Parallel Bridge Corridor with Highway 12 Transportation Management Plan Alternative is added to the FEIS and selected as the preferred alternative. This is a variation on the parallel bridge alternatives addressed in the original FEIS. October, 2009. A Revised Section 4 (f) evaluation is issued in response to comments received on the FEIS. It determines that a 17-mile bridge through the Pamlico Sound – which would later be casually referred to as the long bridge — is not feasible. January, 2010. The Federal Highway Administration requests an Environmental Assessment of the preferred alternative in the FEIS. May, 2010. The Environmental Assessment is released. June, 2010. A Public comment period on EA is announced with public meetings scheduled for July. July 13, 2010. The organization “Bridge Moms” is founded with the mission “To give voice to the fears and concerns of the mothers who have children on Hatteras and Ocracoke islands whose wellbeing is dependent on the lifeline of Herbert C Bonner Bridge.” The Bridge Moms would go on to be credited for making a substantial contribution to the efforts to replace the bridge through their letters, public campaigns, and partnerships and meetings with local and state officials. December, 2010. NCDOT issues a Record of Decision to build a parallel bridge and address the problems areas, or “hotspots,” in a segmented fashion at a later date. July 1, 2011. Defenders of Wildlife and the National Wildlife Refuge Association, represented by the Southern Environmental Law Center, file a lawsuit in federal court to stop the plan by NCDOT and the Federal Highway Administration. July 27, 2011. NCDOT awards a $215.54 million contract to the design-build team of PCL Civil Constructors Inc. and HDR Engineering Inc. of the Carolinas in July 2011, just weeks after the environmental groups file their lawsuit in federal court. September, 2013. The U.S. District Court Judge Louise Flanagan rules in favor of NCDOT and FHWA. October, 2013. SELC appeals the lower court ruling on behalf of its clients. May, 2014. The U.S. Court of Appeals for the Fourth Circuit hears oral arguments in appeal. August, 2014. The U.S. Court of Appeals issues a decision that upholds part of the lower court judge’s decision, and remands part back to the original judge for further consideration. Sept. 10, 2014. NCDOT and other defendants and SELC, on behalf of its clients, announce that they are in conversations to negotiate an end to the lawsuit. June 15, 2015. The go ahead for the replacement project is officially announced by the North Carolina Department of Transportation (NCDOT) after the organization, along with the Department of Environment and the Federal Highway Administration, reaches a settlement with Defenders of Wildlife and the National Wildlife Refuge Association. August 6, 2015. The Fourth Circuit Court of Appeals publishes its decision in the lawsuit, affirming in part and reversing in part the District Court decision, and remands the case back to Judge Louise Flanagan of the Eastern District of North Carolina. August 11, 2015. The case is voluntarily dismissed on motion of all parties in U.S. District Court. September, 2015: The National Park Service issues a Record of Decision, adopting the Final Environmental Impact Statement and Environmental Assessment of North Carolina Department of Transportation’s plan for the replacement and demolition of the Herbert C. Bonner Bridge. November, 2015: The Cape Hatteras Electric Cooperative, in cooperation with North Carolina Department of Transportation, announces plans to relocate its 115kV transmission cable south of Oregon Inlet to allow NCDOT the needed space to begin construction of the Bonner Bridge replacement. 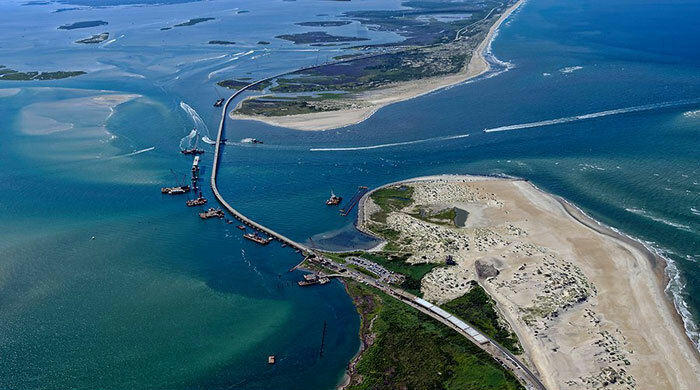 January, 2016: The North Carolina Division of Marine Fisheries announces plans to use the forthcoming rubble from the existing Bonner Bridge to bolster artificial reefs in and around Oregon Inlet. February, 2016: PCL Constructors begin preliminary work ahead of the Bonner Bridge replacement project, by placing erosion control measures and clearing vegetation on both sides of the highway, and adding several feet of pavement to either side of the road to accommodate traffic being shifted to the east to access the existing bridge during construction. March 8, 2016: A groundbreaking ceremony is held for the start of the replacement bridge. Gov. Pat McCrory, N.C. Transportation Secretary Nick Tennyson, and other state and local officials attend the celebration. May 10, 2016: The first piling that will form part of the foundation of the new Bonner Bridge replacement is installed. October, 2016: Due to Hurricane Matthew, two barges break loose from a mooring located 8 miles southwest of the bridge site, and float roughly 20 miles south down the Pamlico Sound until they run aground in Avon. One barge, which is moved on Friday, Oct. 21, was located between south Avon and Canadian Hole. The operation to move the barge took roughly four to six hours and utilized the help of a company that specializes in marine salvage, Center Lift, which is based in Louisiana. The second barge is moved days later from the Hatteras Colony neighborhood of central Avon, after high winds and rough surf depart the area. November 1, 2016: Representatives from the NCDOT confirm in a press conference that the Bonner Bridge replacement project is on track, despite setbacks from Hurricane Matthew. As of November 1, 98 pilings out of 673 have been driven, and 10 bents – or piers – are nearly completed. February, 2017: Construction begins on two of the 61’ ft. columns that support the bridge’s 11 highest spans, and both the southern and northern sections of the new Bonner Bridge replacement are beginning to take shape, per a Dare County video update. April, 2017: At the northern edge of the bridge, five spans of the bridge’s decking are installed and poured with concrete. Three of the spans – each 160 ft. in length – are some of the longest in the structure’s design. July 27, 2017: At 4:30 a.m. on Thursday morning, PCL Construction, the company constructing the new Bonner Bridge replacement, mistakenly drives a steel casing into three underground transmission cables that run between the south end of the Bonner Bridge and the overhead riser pole, causing a transmission outage for all of Hatteras and Ocracoke islands. July 27, 2017: At 5 p.m., the Hyde County Board of Commissioners issues a mandatory evacuation for all non-residents, leading to the evacuation of 10,000 Ocracoke Island visitors. July 29, 2017: Dare County issues a mandatory evacuation of visitors due to the power outage, and thousands of visitors are evacuated from Hatteras Island in an effort to get generator power up and running for the few residents who remained. 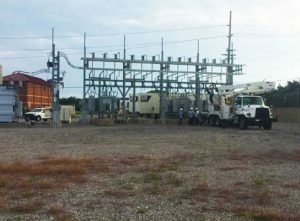 August 3, 2017: The overhead line solution to the power outage is completed, and the power is reconnected for Hatteras and Ocracoke islands. August 4, 2017: Visitors are allowed back on the islands on Friday starting at noon. December 28, 2017: DOT announces that 25 spans are completed stretching for .75 miles in their latest video update. Meanwhile, out in the waters of the inlet, crews have completed half of the navigation zone’s new structure. February 7, 2018: Having completed the southern half of the navigation zone’s new structure, crews work to construct the five northern spans of the bridge before connecting the two halves together. March, 2018: Despite a wave of nor’easters that affects the islands, work on the new Bonner Bridge replacement continues to progress, with approximately 65% of the project completed, per an update from the NCDOT. April, 2018: NCDOT announces that Bonner Bridge replacement is on track to open in late 2018. May 2018: A lawsuit that stemmed from the 2017 power outage is settled in the amount of $10.35 million. June, 2018: At the northern construction area, the last of the project’s pilings are driven as crews focus on the installation of the remaining footings, columns, and caps that will rise to meet the new navigation span. In the navigation zone, crews complete of the two remaining navigation spans. Upon the completion of these spans, crews can then connect the northern half of the structure to the southern half. 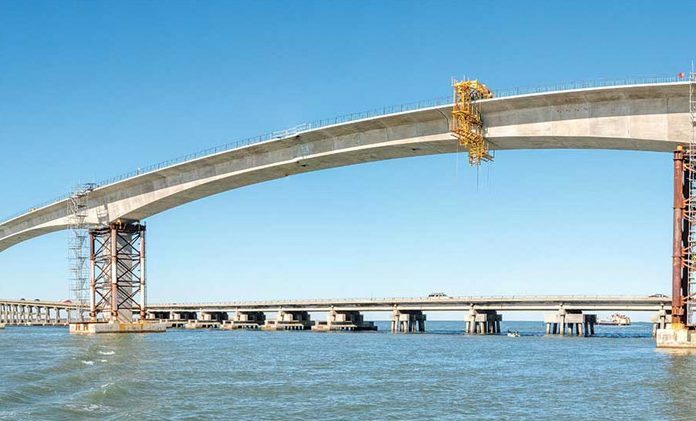 July, 2018: A Dare County update announces that the new Bonner Bridge replacement is 88% complete. August 27, 2018: The Bonner Bridge replacement is officially connected from end to end, after construction crews install the final girders that link the 2.8-mile-long bridge into one continual structure. September 1, 2018: A Dare County update announces that the new Bonner Bridge replacement more than 90% complete. October 31, 2018: The NCDOT reports that a major milestone is reached as concrete is poured on the final road deck of the new Bonner Bridge replacement. November, 2018: The Cape Hatteras Electric Cooperative (CHEC) announces that their contract crew, New River Electrical Corp, has started work on installing new transmission cables at the Bonner Bridge site. The work is expected to be complete with the opening of the new bridge. December 13, 2018: Due to a pattern of bad weather and storms throughout the fall season, the opening of the new Bonner Bridge replacement is delayed from the originally scheduled January 2019 to February or March of 2019. January, 2019: At the January 7 meeting of the Dare County Board of Commissioners (BOC), the commissioners decide to reach out to the public to obtain input on a potential name change for the new Bonner Bridge replacement. The name “March Basnight” wins the popular vote via an online form. 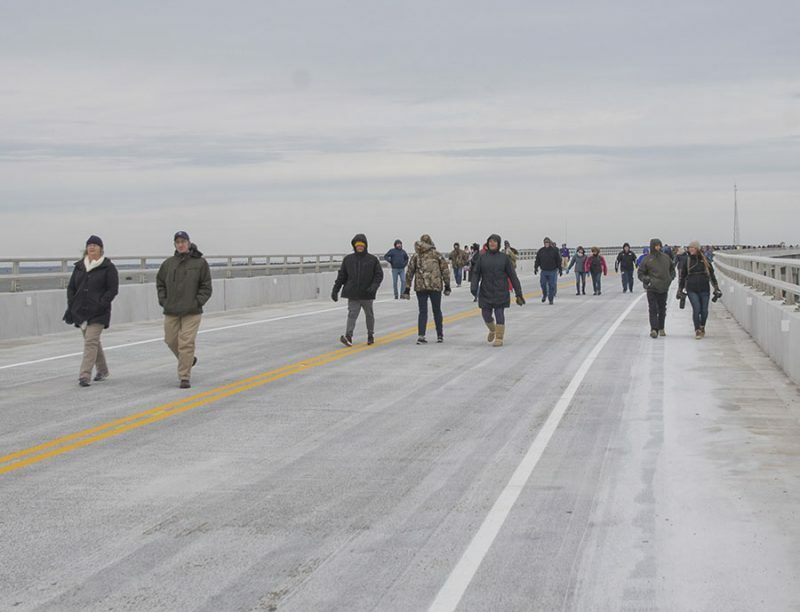 February 9, 2019: Hundreds of Dare County residents and visitors celebrate the completion of the new Oregon Inlet Bridge, which is accessible to pedestrians and cyclists who want to walk along the newly finished structure. A ceremony marks the imminent bridge opening with local and state representatives in attendance. February / March, 2019: The Bonner Bridge replacement is slated to open to vehicular traffic.